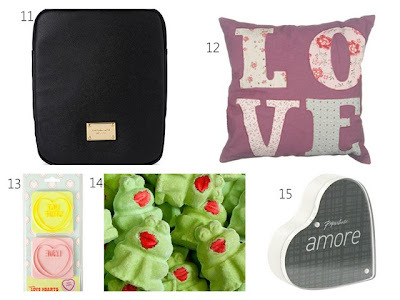 As it's Valentine's Day on Tuesday I thought I'd put together some ideas to inspire you if you're struggling to find a gift and heading out shopping this weekend. The selection includes gifts suitable for guys and girls and covers a range of budgets. If cupid is yet to strike why not treat yourself and indulge in a little retail therapy! There are lots of thrifty ways to celebrate. 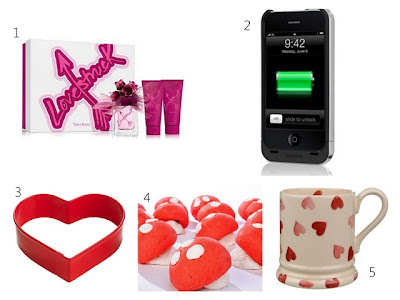 You could bake some heart shaped cookies or use the embossed chocolate moulds to send a message to that special someone. I think I might treat myself to some of Lush's limited edition Valentine's Day products. Their magic mushroom bubble bar is scented with strawberries and cream leaving your bath smelling sweet, whilst the leap frog prince fizzes with a sandalwood, jasmine and rose fragrance. ...I'd also be very happy to receive a box of cupcakes! That mug is just the cutest! Absolutely LOVE it :) And as for those cupcakes - tempting.com! I love all of these, I might just have to spoil myself! I'm loving the look of those Lush goodies too, might have to treat myself! The leap frog one is so cute! I am not a massively valentines day fort of a person - but my boyfriend and I make the effort to get each other a card and either eat out the weekend before or after or cook a nice meal together. 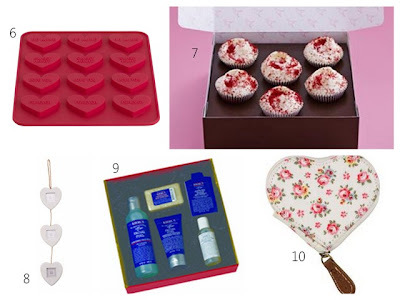 I do love some of the things you've picked here but as both of our birthdays are near valentines day I think I'll be saving these ideas for then! That juice pack is such a good idea...but why are they so expensive? such a great list. the cushion is really sweet! adorable list (: hope you have a sweet valentine day ! I love Red Velvet Cupcakes, yum! I'm gonna order ME some heart goodies tonight! I love that heart mug to death. I think it's Valentine's day's effects, but I've been really feeling like a cupcake lately.